Richard, one of the vets out there in the real world who often sends me good e-diagnosis pics , asks of this case, whether I think this is a melanoma or not. What do you think? It’s appeared in the last month, according to the owner. Well its a bit strange isn’t it – raised and apparently rapidly developing. 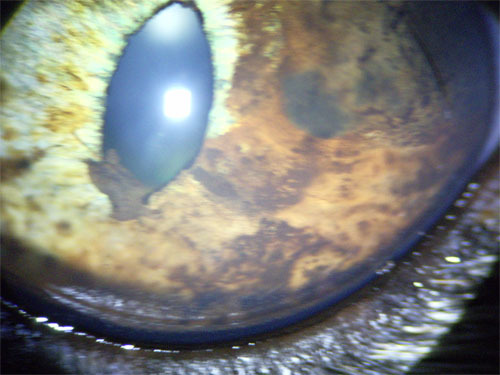 But the image here is what I’m more used to as an iris melanoma in a cat – slightly raised and with a velvety texture. I vote for waiting on the first case for another month and seeing what happens. But we don’t want to let it get this far, when the literature shows us that , having reached the boundary of the iris, it may well have metastasized. 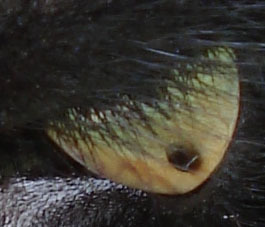 This entry was posted in Cases and tagged cat, iris dyscolouration, Iris melanoma. Bookmark the permalink.